I started my walking tour at the way out of the metro station Pont Marie (on metro line 7) and ended it at the metro station Sully Morland (on the same metro line). But one can also finish it at the metro station Saint Paul (on metro line 1). 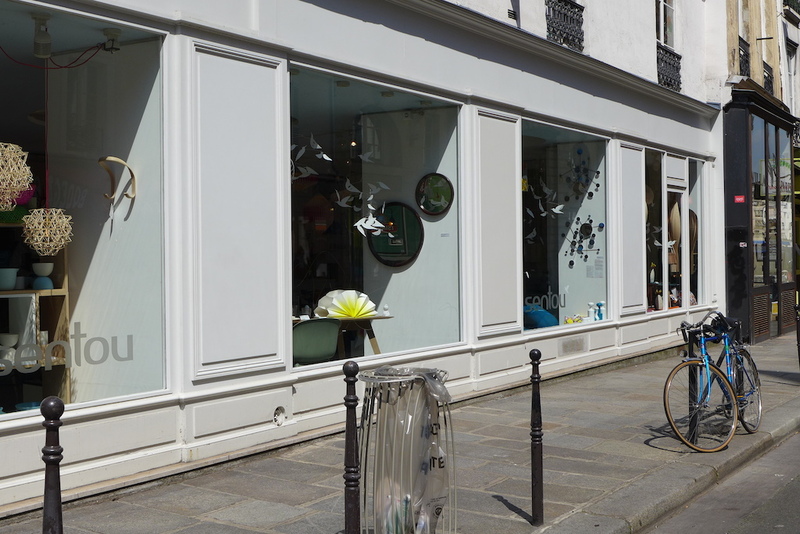 I suggest you to discover in pictures the places that I love and which are in my opinion the most remarkable and not to be missed while having a walk in the Jewish area of the Marais. 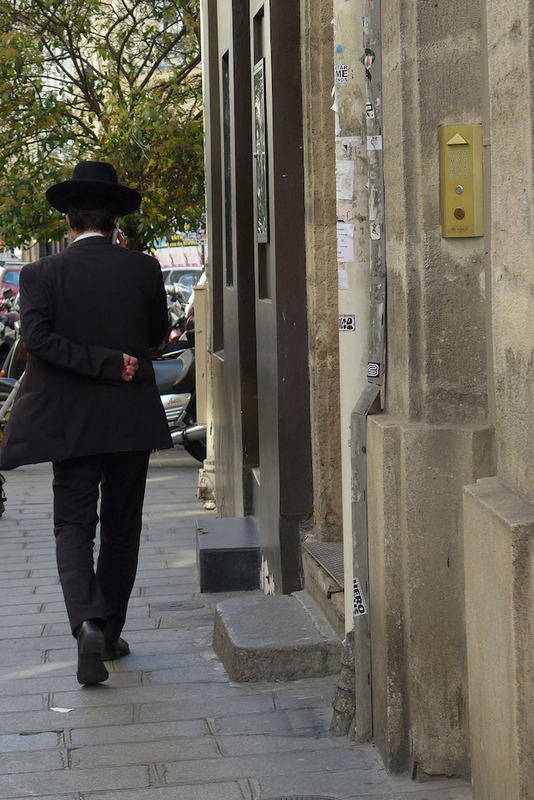 And one more piece of advice: Avoid going for your walk on Shabbat (friday evening and saturday); otherwise the traditional shops would be closed! 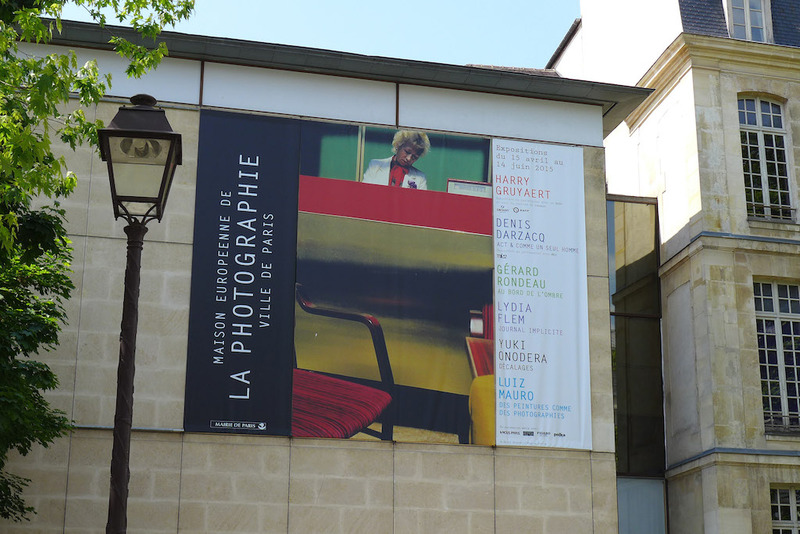 The Maison Européenne de la Photographie is one of the museums in Paris where to see major photo exhibitions. 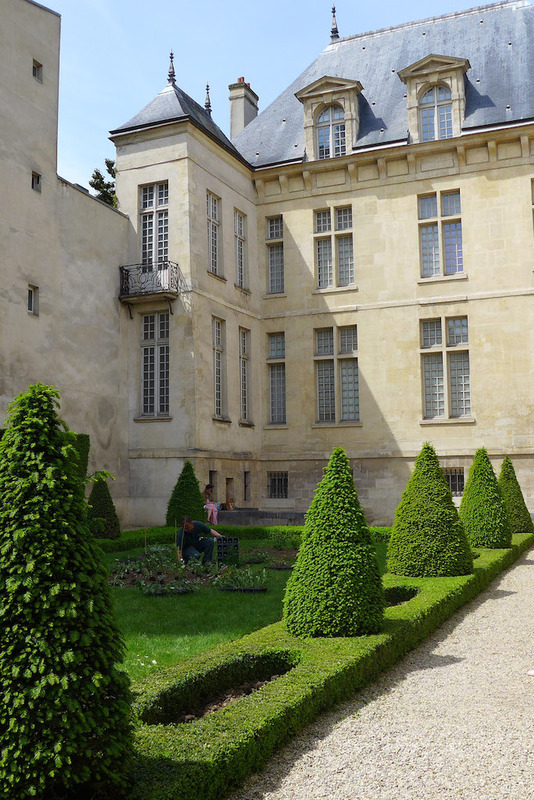 It is located in the magnificent Hôtel Hénault de Cantobre, one of those Hôtels Particuliers of the 18th century as many can bee seen in the Marais area. The schedule of exhibitions changes regularly and one can discover it on the Museum’s website. 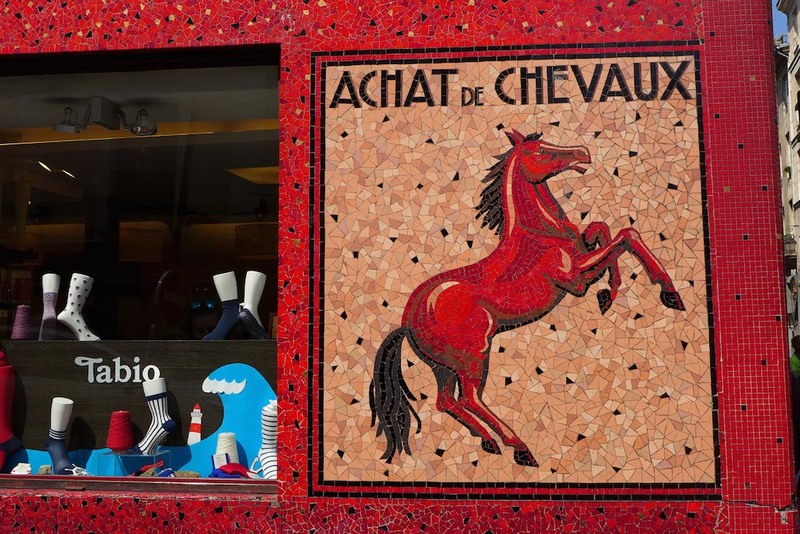 At the moment and until mid-June a very interesting exhibition of the colourful photographies of Harry Gruyaert, a Belgian artist, is taking place there and is really worth the visit. At the end of the rue de Fourcy I have turned right in the Rue François Miron, which is a very pleasant quiet street where to stroll: lovely shops such as Sentou, a store specialized in interior decoration and offering quality stylish objects and furniture, all traditionally made ; nice bars or restaurants, especially a good traditional French restaurant and wine bar: Au Bourguignon du Marais (count 19 or 24€ for lunch – 35 to 50€ for dinner) ; and something rare in Paris and not to be missed, at #11 and #13 of the street, two remarkable medieval houses which dated from the 14th century and are in very good condition as they have been renovated several times since then. 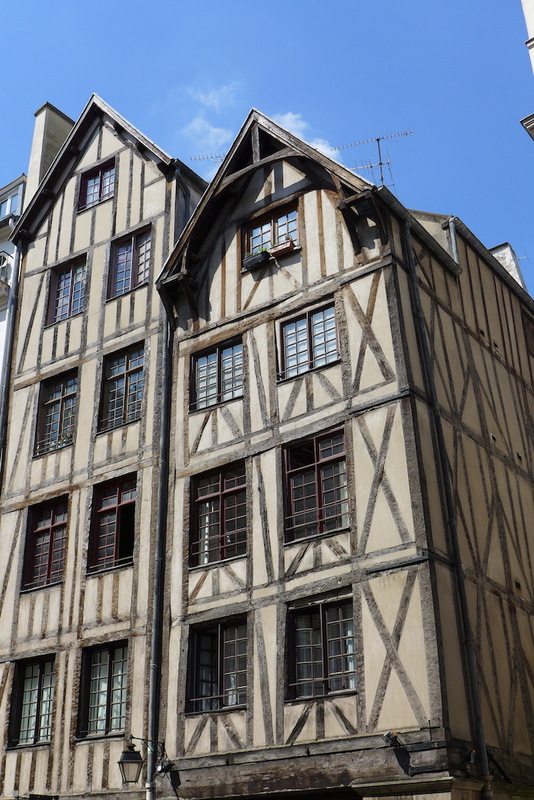 I have then turned right in the first street after walking along the medieval houses, crossed the Rue de Rivoli and kept walking straight ahead in the rue Vieille du Temple. Here is the western boundary of the Jewish area. At the corner with the rue du Roi de Sicile one cannot miss a store selling socks which is of no particular interest except its beautiful red-tiled front side: it used to be a horse butcher’s! 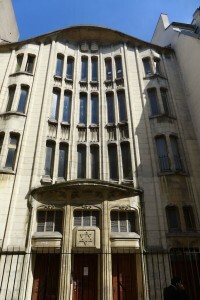 The Jewish area of the Marais is just on the other side of the rue Vieille du Temple, bordered by the Rue du Roi de Sicile on the south side and by the Rue des Rosiers on the north side. 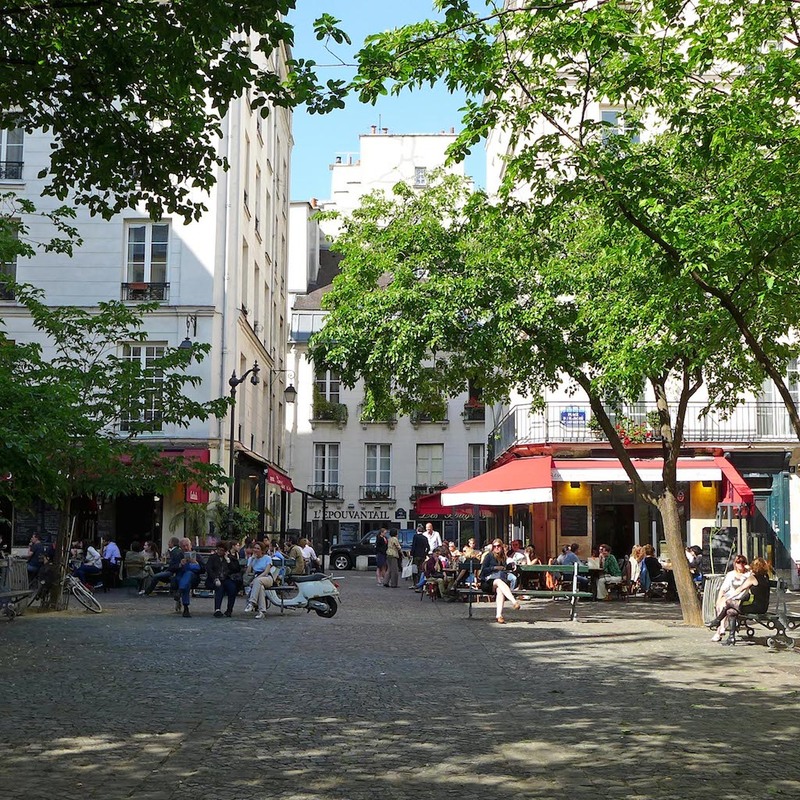 It is in fact a very small area whose main streets (apart the two mentioned above) are: the rue des Ecouffes, the rue Ferdinand Duval and the rue Pavée. 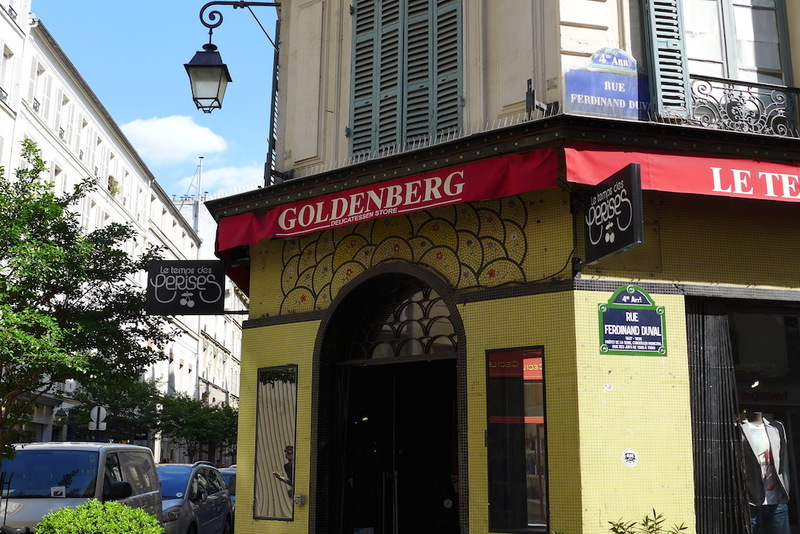 The Rue des Rosiers is the main and most lively street of the Jewish area. 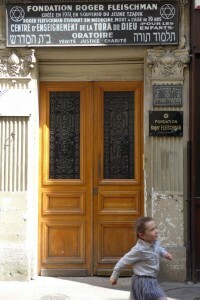 For fifteen years many traditional Jewish stores have closed and been replaced with trendy fashion shops. 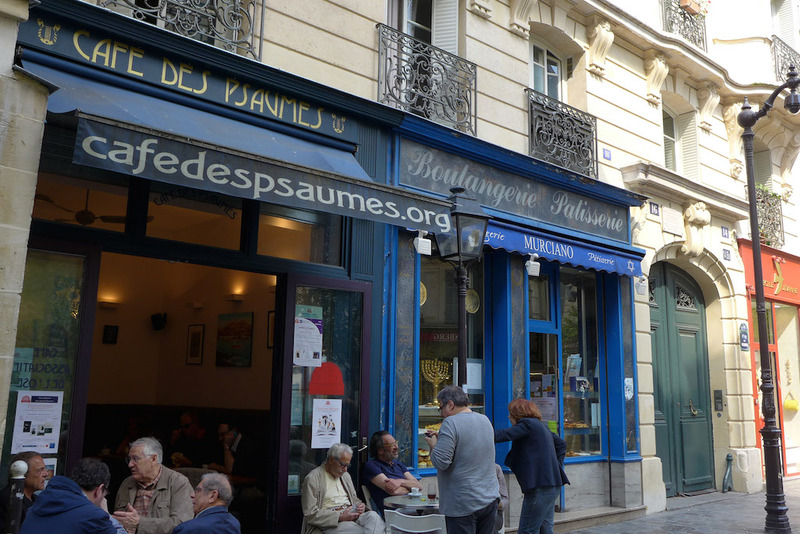 However the Rue des Rosiers remains an iconic street for the Jewish community and several famous traditional shops are still there and very popular. 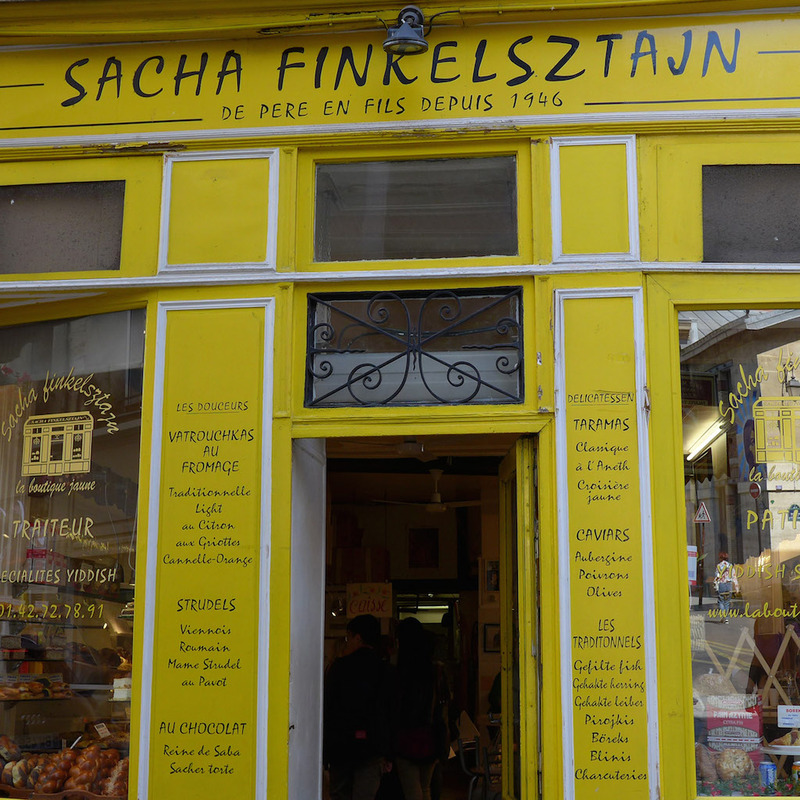 Among them my four favourites are: The Deli Sacha Finkelsztan; The Restaurant Chez Marianne; L’As du falafel and Le Café des psaumes. 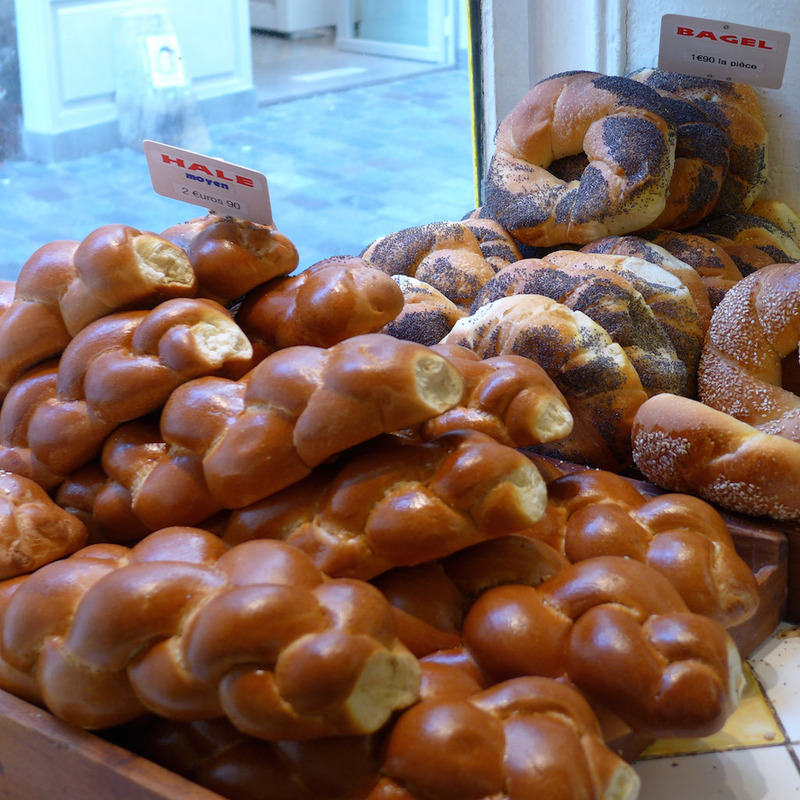 The first three offer good traditional Jewish food. The last one is a literary café and a community center restricted to its members during the day but open to the public in the evenings and sundays. Further in the street two buildings are really worth a look: On the right side, the famous former Deli shop Goldenberg: it is now a fashion store, Le Temps des cerises, which has kept the beautiful yellow-tiled former shop front; and further on the left, the former Hammam Saint Paul, turned into another fashion store, Cos.
And at the end of the street, after crossing the Rue Pavée, is one of the most famous tea rooms in Paris: Le Loir dans la théière. It has been existing for more than thirty years. I love the decor and ambiance of this place, inspired by Alice in wonderland and looking more like a secondhand goods shop than like a tea room. 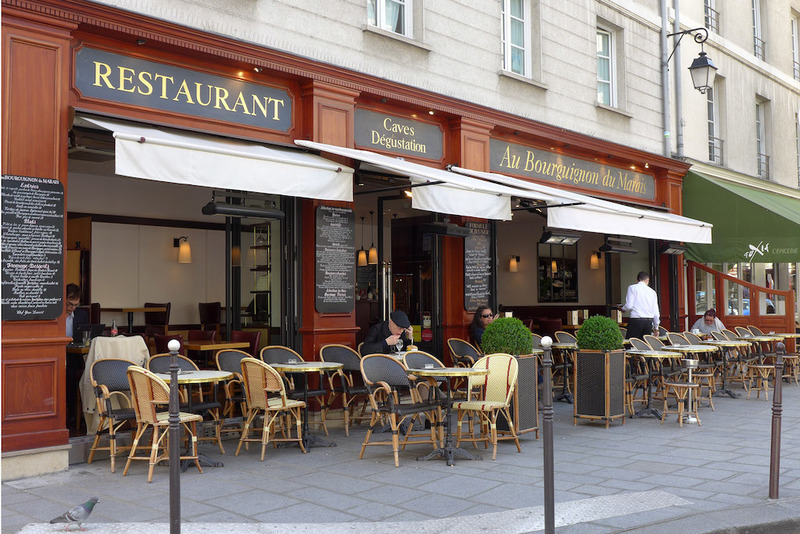 And I recommend it for a cup of tea and a piece of cake on a weekday afternoon… but not really for a brunch during the weekends: It is then much more crowded and busy with Parisians and tourists… and not always so welcoming! 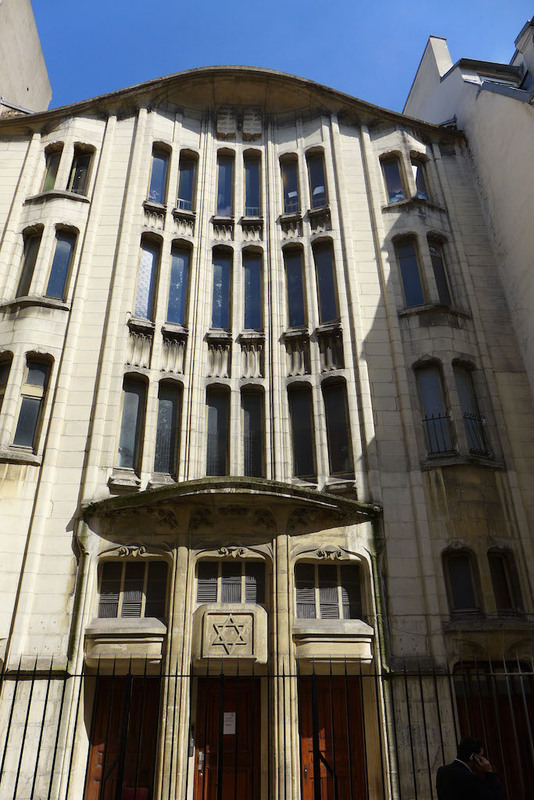 The Synagogue of the rue Pavée was designed in 1913 by the French architect Hector Guimard and one can admire its Art Nouveau front side. The tall and slim building all in white stone contrasts with the surrounding houses. It is still a place of worship and cannot be visited except on special occasions such as the Journées européennes du Patrimoine in September. 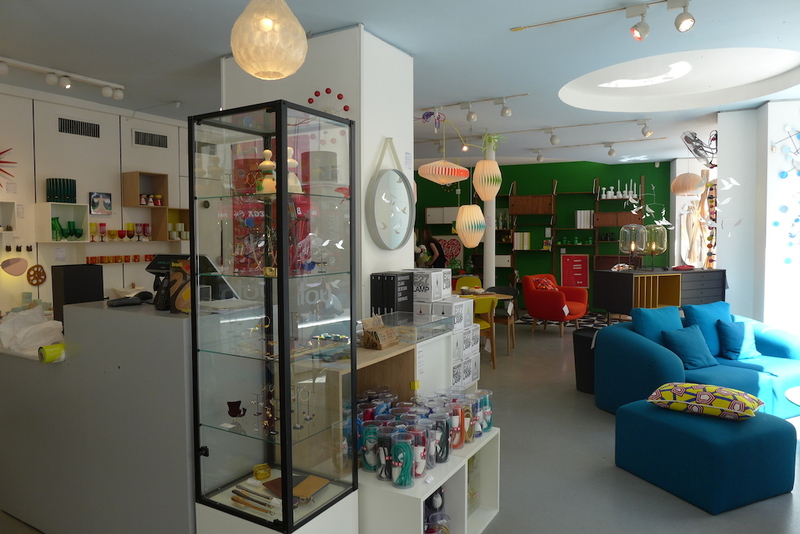 The inside decoration and the furniture have also been inspired by the Art Nouveau style. 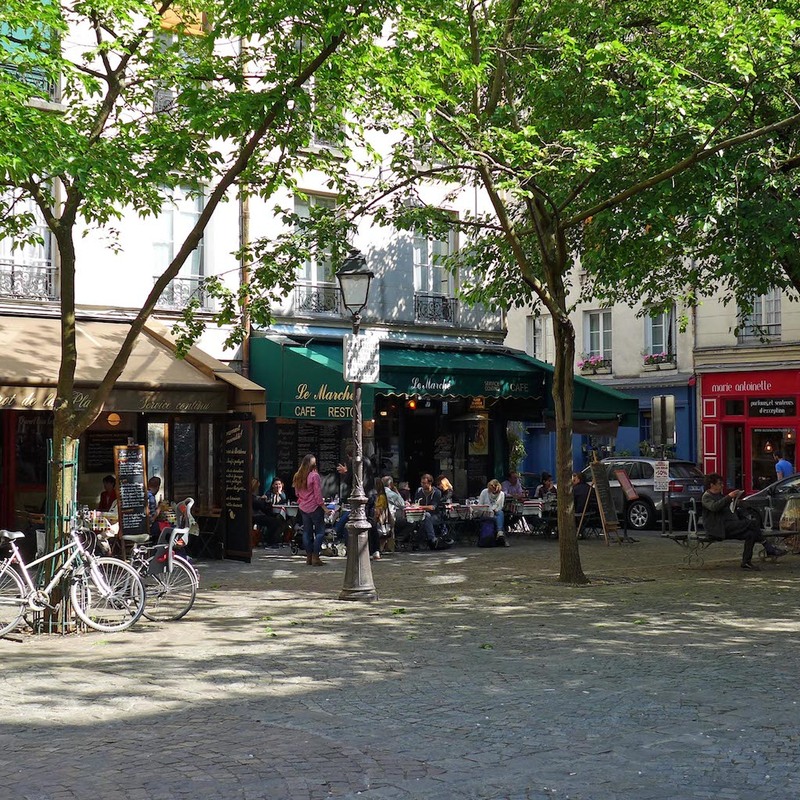 The Place du Marché Sainte Catherine gives onto the rue Saint Antoine on the south side and onto the peaceful Rue de Jarente on the north side and is a very charming quiet square where to sit at a table on the terrace of one of its numerous restaurants for a drink, a lunch or a dinner. I have not tried any of them (in fact the only one I knew has changed) and cannot tell how the food is. 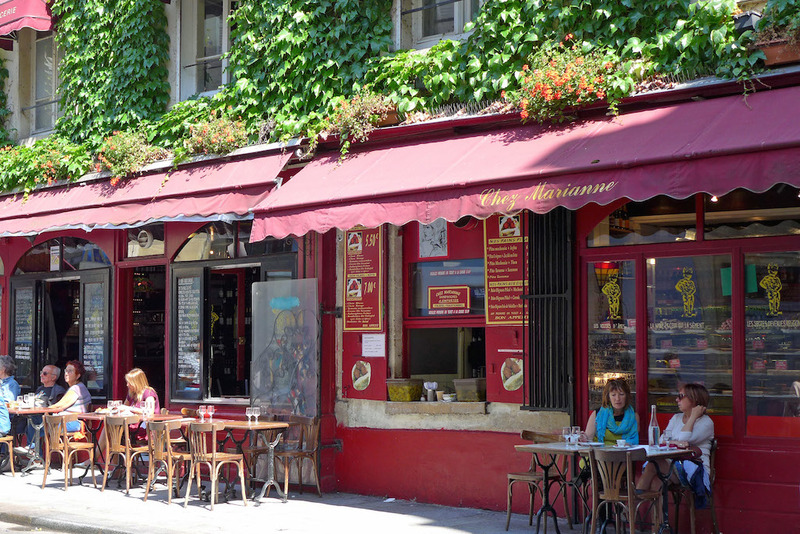 But the surroundings are really idyllic, probably among the most charming in all Paris. 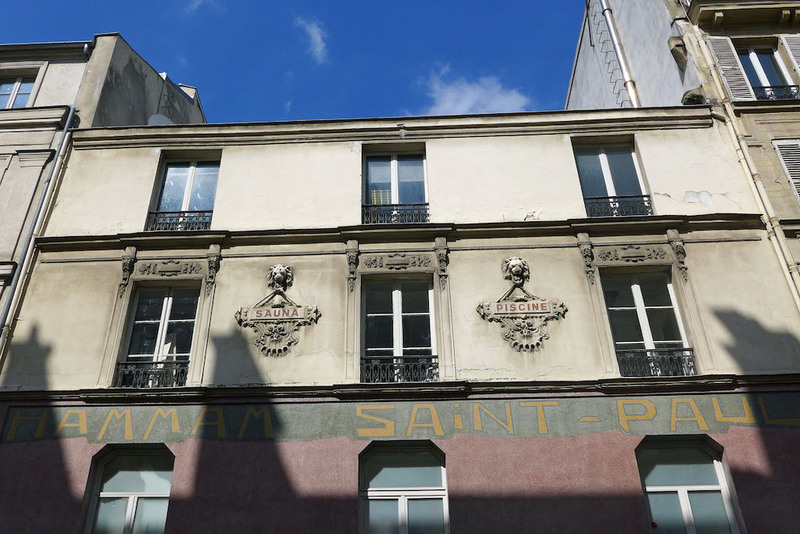 From there one can easily reach the Rue Saint Antoine and either metro Saint Paul (on the right) or Sully Morland (further south). 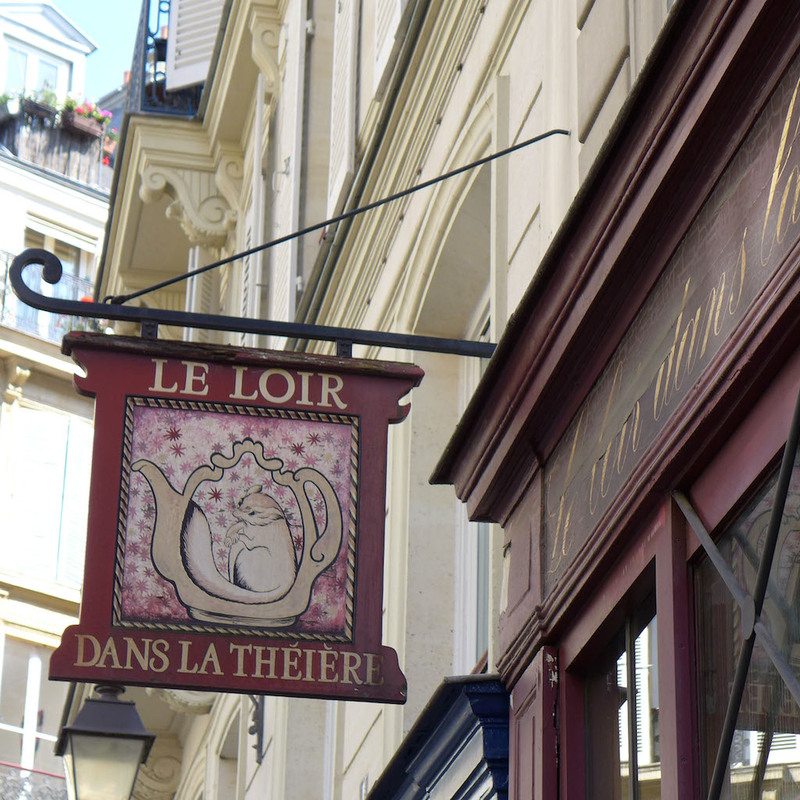 North of the Rue des Rosiers lies the main street of the Marais area, the Rue des Francs Bourgeois. 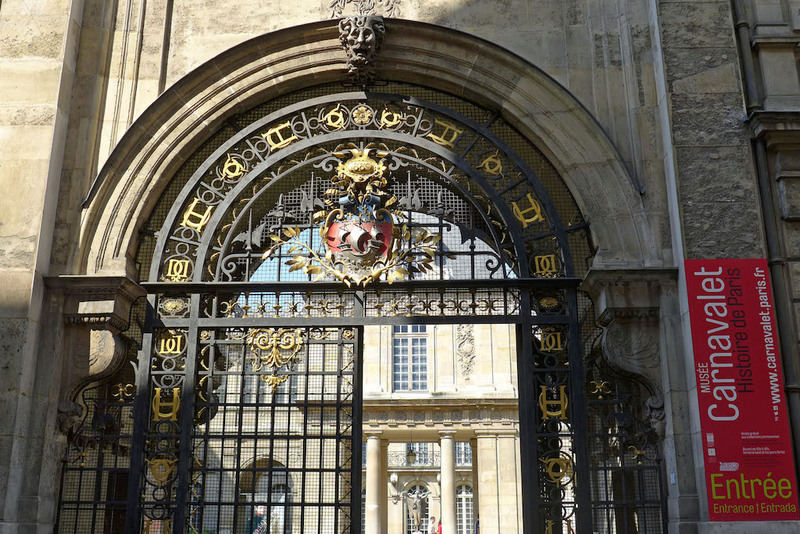 There and a little further north one can find the main museums to be visited in the Marais. 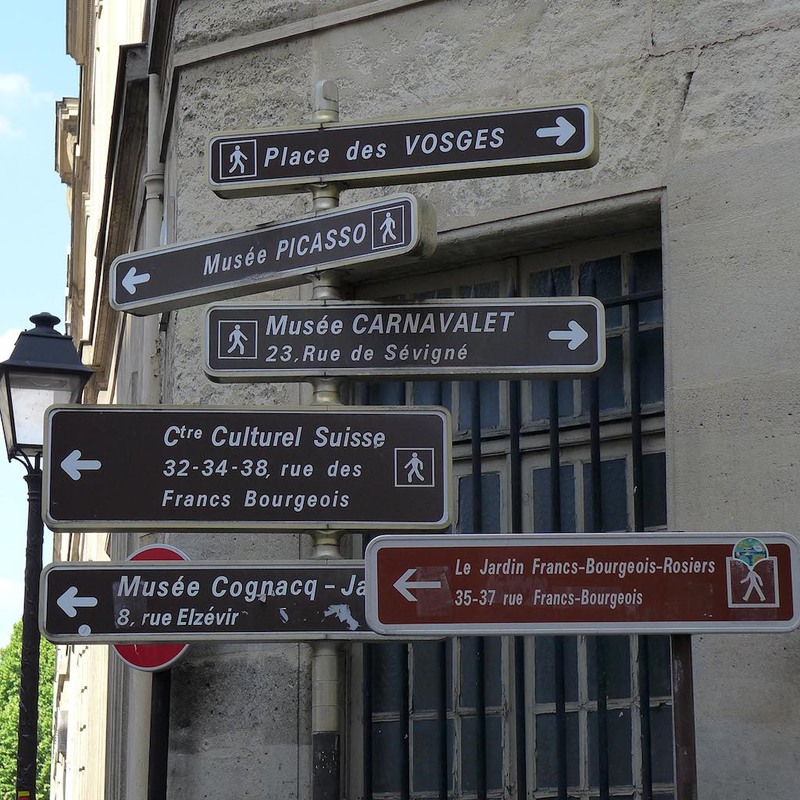 Two of them are free: The Musée Carnavalet, which is the museum of the history of Paris, and the Musée Cognacq Jay (described in a previous post). 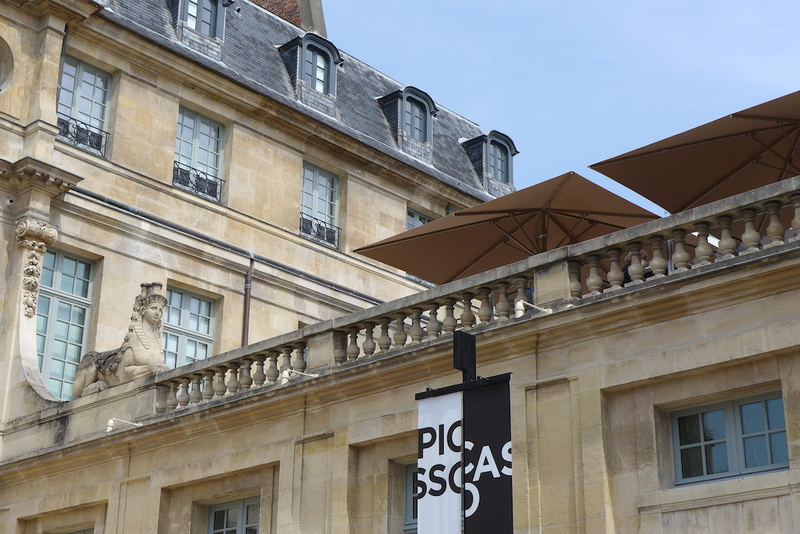 The third one is the famous Musée Picasso, which has just reopened after a full renovation and is one of the major museums to visit in Paris. If you go there at lunchtime on a weekday, you should not queue for long. 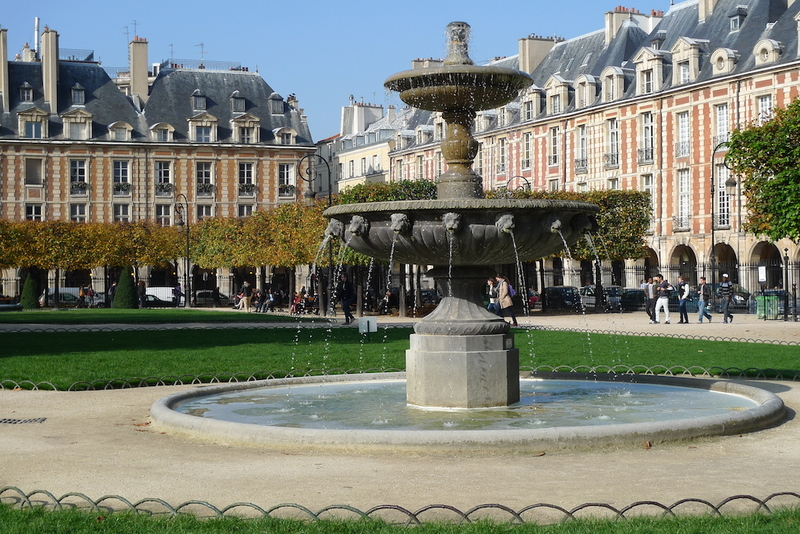 The Place des Vosges is not only the oldest but first of all one of the most beautiful square in Paris due to its very harmonious buildings dated from the 17th century. One never get tired of it! And at that time of the year it is so pleasant to have a rest on one of the lawns of its garden… provided that one can find an empty space in the middle of the high school students of the neighbourhood! 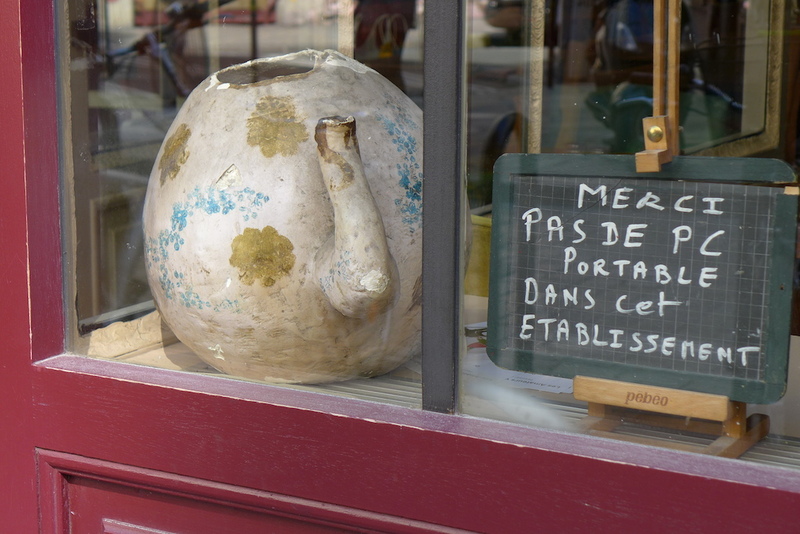 Very nice description of the Marais. It’s almost like being there. There’s so much history! Thank you. I have sent this to my family in Jerusalem who arrive in Paris on Sunday morning. 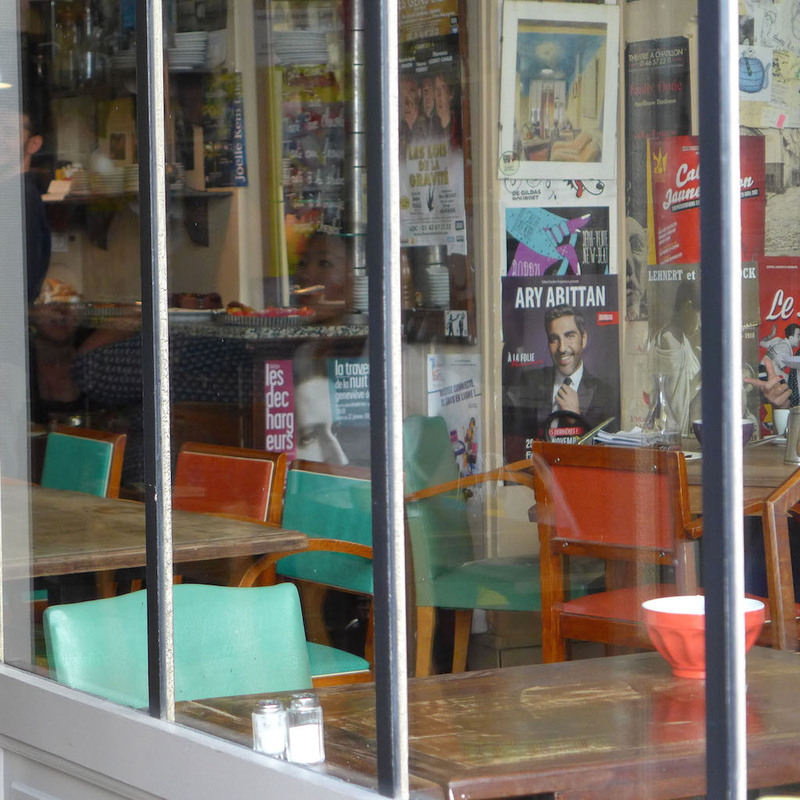 Half of the family of eight has been to Paris before; for the rest, it’ll be the first time. Myself, I have lost track of how many times I’ve been to Paris, my favorite city to visit in all the world. I always think I might be overselling Paris, but I am happy to report my cousins love Paris. Alas, they are strictly kosher and have pretty well figured out where to eat. Not for me, though. LOL. Previous Previous post: Experience the Unique Atmosphere of Roland-Garros! Next Next post: The ‘Jeanne Lanvin’ Exhibition in the Palais Galliera: Simply Outstanding!